Westwood ends up with a 73 and +9. A mucky old day for Lee that. So 15 years ago a 17-year-old amateur called Justin Rose pitched in at the last hole in the 1998 Open Championship at Royal Birkdale to secure fourth spot. Any heroics today I wonder? Strange thing is that pars will probably earn him glory today. Boom - a birdie putt rolls in and Rose is on -1. That's two birdies in a row. Ouch. Here comes the wet stuff. The rain is bucketing down and Rose tries a cheeky hook on 14 but finds the sand. Finishing off this amazing weekend with family and the US open. So blessed! Mickelson's putt slides past while Rose mis-connects from the bunker and looks set to drop one. The tension builds. So it's another par for Mickelson and he's got six holes to go. And it's a disaster on the 13th with his ball missing the green and finding some really sticky horrible long stuff. Rose misses his par putt. I am finding the booing of players disgusting. Not the thing done at a golf tournament I think. Hole 13: Mickelson tells the spectators "put your phone away" and scoops the ball out of the long grass to the back of the green. As best as he could have hoped for. Mickelson misses a tricky putt and that's a bogey. Big groans from the gallery. +1. 13 holes gone for Hunter Mahan and his card's got one bogey and a dozen pars. Just what the doctor ordered. After the madness on the third hole when Luke Donald slapped his ball into a female spectator on the bank, Rickie Fowler comes to close to whacking someone in the sitting gallery at the 17th. Mr Tango is unhappy and tries to chomp on his club as one lad in the stand gets up and reveals he's caught the ball...well played sir. Birdie putt for Rose at 15......ooohhhh and it just rolls past. While Day battles back to save par on the 16th. 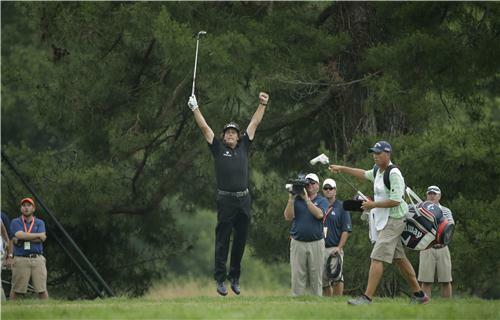 Fab comeback with the putter as Mickelson saves par on the 14th. How crucial could that be? 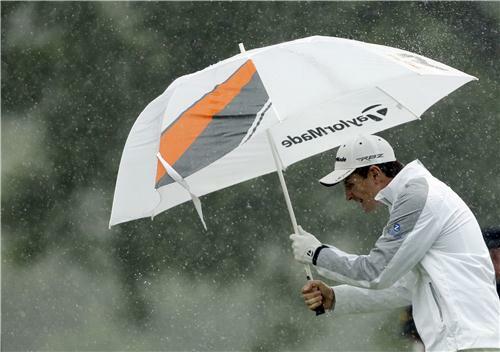 The sun has now got his hat on at Merion as Mickelson prepares to tee off at 15..."c'mon baby. c'mon baby go go go".....that's a whopper from Leftie. Rose up next on the 16th and his ball lands nicely on the front of the green...but then rolls back. Par will be tough. We're officially into the business end of the 113th US Open. How do you see this going? 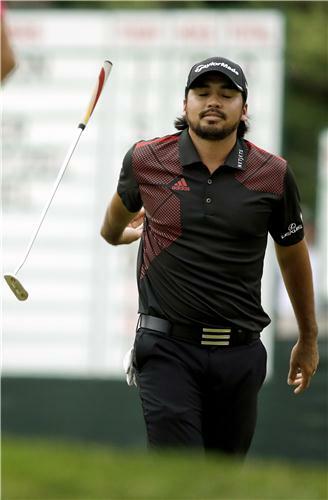 Fist pumped and Jason Day holes another corker to save par. +2.